Creeping Towards Normal: Thanksgiving (still) Comes First! This is (largely) a repeat of the last two year's TCF post. But here it is, because I believe this topic is just that important. May your Thanksgiving be full of love, laughter, good food, and good company! Most of you who come here also read my dear friend Sully. Which means you are already familiar with the topic of Today's Post. The One Where Thanksgiving Comes First. "If you believe, as I do, that Thanksgiving should play out before Christmas; that Christmas carols should not be heard on the radio before at least Thanksgiving evening; that advertisers who dare to encroach upon Thanksgiving with their hideous advertisements should be told in no uncertain terms that you will not shop at their establishments; that malls who put Santa Claus on display before Veterans Day should be made ashamed of themselves; then please consider doing what I'm going to ask of you. Should you be as incensed as I am concerning Christmas schlock, please post a "Thanksgiving Comes First" entry on your blog. Write from the heart. Everybody who visits your blog will know how you feel. Perhaps they'll also write about it, and so will their friends, and so on. I hope that, if enough of us do this, we might make some small impact. Please title your post "Thanksgiving Comes First". If we all do that, it will make a bigger impact. If you wish to reference this post, or other posts with a similar title, please do so. It isn't mandatory. I'm not looking to drive people to my blog; I'm just trying to make a difference concerning something that truly rankles me." The premise is - as with all brilliant ideas - wonderfully and delightfully simple. Thanksgiving comes first. Before Christmas. Before December. Before Santa, elves, and reindeer, packages, presents and holiday gear. When I was a child, one of the things I looked forward to most was December 1st, when - as if by magic - all of the stores were suddenly bursting with Christmas goodies. Overnight the stores were transformed, and they went from being regular old department stores to Winter Wonderlands, decorated with shiny tinsel, and piles of white, fluffy soapflakes that doubled for snow. Christmas music would fill the air - even on the sidewalks, you could hear Steve & Edye singing "The Christmas Waltz", and Julie Andrews warbling "I'll Be Home For Christmas". There was new merchandise, too; exotic gift items that were only seen during the Holiday Season. It was all so exciting and glamorous to my little self. But before all of that - before we donned our gay apparel to brave the stores, and buy our tree - before that? 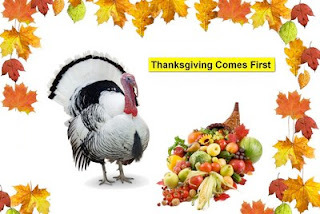 Thanksgiving is more than just the unofficial start of the Holiday Season. Thanksgiving is, in and of itself, an important holiday event. But increasingly we are rushing through (and even past) Thanksgiving in the run up to Christmas. Not only are we losing the meaning, and the traditions of Thanksgiving in the rush to Christmas, but we have cheapened and diluted everything about Christmas as well. Many years ago, I was a retail manager. Later, I was a retail buyer - a purchasing agent for a small, local chain of three stores. I understand, perhaps better than most, the mechanics by which merchandise will arrive in the stores at the appropriate time for the season. The reason - the one and only reason that Christmas-related merchandise shows up in your local shopping venues in October (and increasingly September) is simply that "retail experts" have found that we (the buying public) buy more Christmas stuff the longer it is displayed. They create a false sense of urgency - putting out the merchandise early so that shoppers will believe they must buy NOW or risk never having that Christmas Widget (at a special "pre-season" sale price, of course). And, as stores have learned how to tighten inventory levels so that there is less and less chance of the big after-Christmas clearance sales that the American consumer has come to know and look forward to... shoppers feel even more pressure, believing that if they don't buy it when they see it... they will have lost the chance forever. Originally, there was another reason for taking early delivery of seasonal merchandise. Some distributors used to offer heavy discounts to retailers willing to take early delivery (and thereby make early payment for) seasonal merchandise. This meant that a a retailer might well accept delivery as early as October for goods that would not be displayed until December. Until the rise of discount merchandisers (like Wal-Mart), most stores would simply hold those things until the APPROPRIATE time, and then display them. Once discount merchandisers began to put out whatever was in the warehouse - because "you can't sell it, if they can't see it" - then the inevitable creep of Christmas backwards into autumn began - and continues to this day. Regardless of how, or why, we are a nation on the verge of losing something very precious. I don't want to see Christmas trees next to Halloween pumpkins at the store. I don't want to shop for Labor Day picnic supplies, and see paper plates and napkins embossed with Christmas designs. I want Christmas in December. And before that, I want Thanksgiving in November - with Pilgrims and pumpkins and turkeys, oh my. I want each season in it's turn, and along with it, all of the traditions and meaning attendant to that season. Read Sully's post - and read the posts of his other faithful friends, too. Think about it, and then I encourage you to spread the word as well. The wonderful, amazing, remarkable thing about America is that if enough of us stand up and say that Thanksgiving comes first, something might actually happen. You are such a sweetheart! Even that fruity dessert concoction which I shall think no more about at present because it isn't the season yet and I'll salivate for no good reason isn't as sweet as you! Due to nutty family arrangements, Thanksgiving comes late this year. So its Friday and the only day of the year I can go elbow deep into a turkey without having to come up with an innocent explanation.